Founded in 1972, Chefette is the largest quick service restaurant chain based on the Caribbean island of Barbados. The company currently has 14 locations and is known for its broasted chicken and specialty wraps (known as the "roti roll"). Chefette offers a large variety of food, including lamb chops, wings, onion rings, burgers, salads, pie, and ice cream. According to Travel + Leisure Magazine, Chefette is one of the best fast food restaurant chains in the world. Chefette met ITSENCLOSURES at the National Restaurant Association tradeshow in Chicago, Illinois. The restaurant was interested in outdoor digital menu boards for its drive-thru's. The overall goal of the digital signage project was to remain hip/modern and greatly enhance the image of the brand. 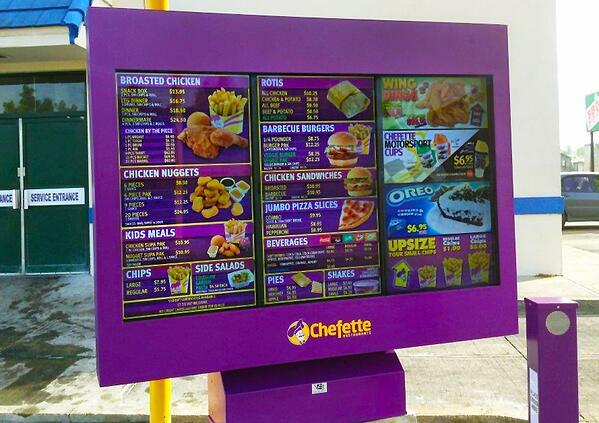 Digital menu boards would help to reinforce Chefette’s already stellar reputation across the island. Chefette desired to make the switch to digital menu boards both inside the restaurant and outside in the drive-thru lane. 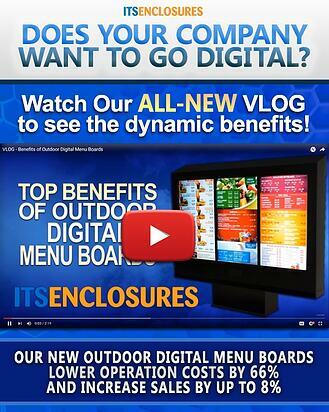 ITSENCLOSURES is one of the top providers of outdoor digital signage in the United States. With unparalleled experience, ITSENCLOSURES provides the best weather-proof enclosures - with the proper thermal management - and brightest screens for the hot and sunny island of Barbados. Chefette also desired to utilize digital menus on the inside of each of the chain’s locations. Because of the salty island air, heat, humidity, and bright sunlight present throughout the year, Chefette required a heavy-duty, outdoor, LCD enclosure solution. Chefette also realized that thermal management would be an important piece of the digital menu solution. Looking for a trusted partner, Chefette turned to ITSENCLOSURES because of the company’s experience with outdoor digital signage in the quick service industry. In addition, ITSENCLOSURES had established partners to easily source the required electronics and mounts. Chefette was able to procure all of the necessary hardware from one company. Chefette installed ITSENCLOSURES’ ViewStation QSR triple screen menu boards at its 10 drive-thru locations. Areas where space permitted also included a single screen presell digital menu board to display promotions and limited time offers. The interior menu board solution included 46-inch LCDs mounted in portrait orientation. The number of displays varied for each location depending on the menu size. Installations were completed overnight to eliminate any disruption of normal business hours. Chefette also customized the exterior of the enclosures with the brand’s color purple and the Chefette logo.